Valvoline did the impossible a couple weekends ago. They got me really, really fired up about NASCAR. I didn’t think I’d be so into it. I’ve never followed the sport and I’ve never seen a live race before. But when Valvoline flew me out to Charlotte, I went with an open mind. I ended up hanging out with some really cool people, and I learned a ton about recycled oil, stock car manufacturing and what goes into equipping, supporting and maximizing the performance of a NASCAR driver. It was awesome. So first things first: the oil. That’s the main reason why this whole trip happened. 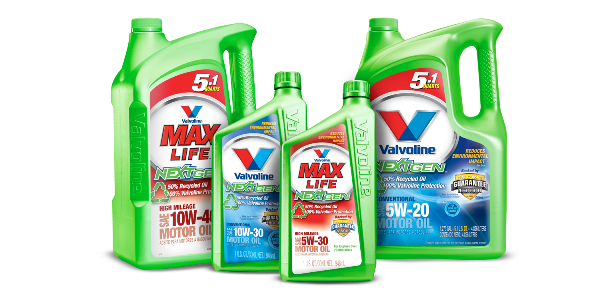 Valvoline wants to get the word out about their new recycled oil, Valvoline NextGen. It’s something they’ve been working on for awhile and it’s actually a pretty smart product. A little bit of back story first. Valvoline was founded by Dr. John Ellis, the guy who invented motor oil way back in 1866. He was futzing around with crude oil, looking for medicinal applications, and boom, he ends up formulating a petroleum-based lubricant that serves as the lifeblood for all car engines today. Valvoline was the first company to produce motor oil specifically for racing, and their racing oil is still the best selling in the industry. 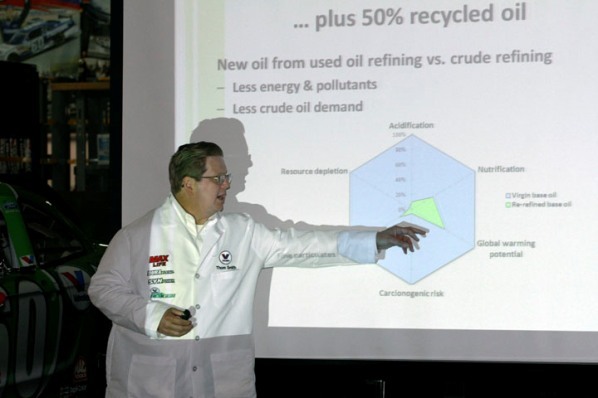 Fast forward to 2005, and you have a convergence of factors that made Valvoline explore the viability of manufacturing recycled motor oil that would be cleaner to produce without sacrificing any performance. Valvoline wanted to explore more sustainable motor oil production techniques. Tech breakthroughs in oil recycling made that option a real possibility. Add in the fact that a critical mass of consumers in America wanted to make a conscious effort to go green, and you had a perfect storm for an advanced leap in recycled oil development. Thom Smith, Valvoline’s VP of Lubricating Technology gave media members a full breakdown on the process of recycling oil. Regular motor oil that you put in your car contains 85 percent base oil and 15 percent additives. The additives are what breakdown over time, but the base oil remains usable. You can actually get more out of used oil that you can from crude oil. Used oil has less contaminants than crude and more usable oil molecules. When you extract crude oil, only 15 percent of it is usable as a lubricant. When you’re dealing with used oil, 75 percent of it can be re-used as a lubricant. Recycled oil used to be inferior. In the past, the development of recycled oil required an acid clay filtration process that included dewatering and treatment with clay and sulfuric acid. With advanced refining techniques, recycled oil now goes through a flash distillation, thin film evaporation and hydro treating process. The old way of refining used oil created all kinds of nasty leftover materials. The new method creates much less waste. But the proof is in the high performance pudding. Valvoline recycled oil has been tested under the most extreme conditions and it performs as well or better than conventional motor oil. It’s cleaner to produce, results in less wear on your engine (pistons, bearings, etc.) and it’s good enough to be used in professional racing. Valvoine partnered with Roush Yates Racing to introduce NextGen oil to professional drivers. If NASCAR and other motorsports drivers can win races with NextGen, it’s certainly good enough for consumers to use in their cars. The NextGen formula contains only 50 percent recycled oil, but the technology is available to produce recycled oil that contains a higher percentage of used oil. Supply is the issue. As more used oil becomes available for refining, the amount of used motor oil that appears in new recycled oil formulas will continue to increase. Valvoline is encouraging consumers to return their used motor oil to places like Advanced Auto Parts and Auto Zone. One gallon of used oil can contaminate up to 1 million gallons of water. So if you can, turn in your used oil and make sure it can be recycled. 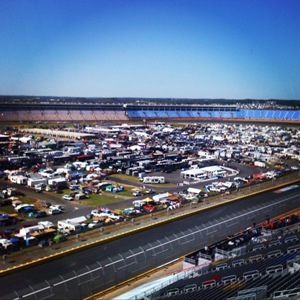 After touring the Roush Yates Racing facilities (where I met Jack Roush and Doug Yates), I got to visit the Charlotte Motor Speedway for the Bank of America 500. I toured pit row, met drivers and pit crew members and I got to see 43 drivers compete in a three-and-a-half hour night race. There were 16 lead changes, eight caution flags and some pretty intense moments. Matt Kenseth finished first, and he’s currently trailing Carl Edwards in the Chase for the Sprint Cup. 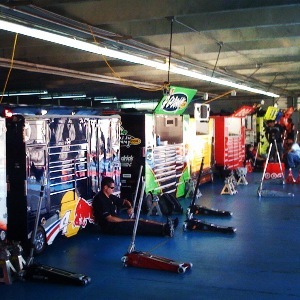 I watched most of the race from the Valvoline luxury suite, but I also spent some time right at the edge of the track. I wasn’t expecting the noise and reverberations to be so addicting. When all those cars scream past you at speeds of almost 200 mph, the sounds and impact of the momentum shakes you to your core. It was a trip. I can see what all the fuss is about now. All in all, it was a pretty sweet mission to Charlotte. I want to thank Valvoline and Roush Yates Racing for a fun trip and for exposing me to something I never thought I’d experience. Print article This entry was posted by Chris Stout on October 26, 2011 at 1:56 pm, and is filed under Sports. Follow any responses to this post through RSS 2.0. Both comments and pings are currently closed.